Write the Book Now! Interview and Podcast host. 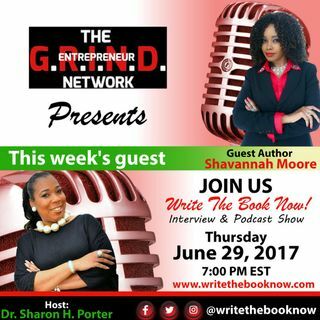 Dr. Sharon interviews, Author Shavannah Moore, author of D.I.V.A.S (Driven Individual Visionaries Accomplish Success) Ms. Moore discusses her troubled life as a teenager and how she overcame the "I'm not good enough" syndrome". Ms. Moore's message is "No matter what, don't give up!" D.I.V.A.S. is an anthology of 12 authors sharing their real life, raw and beautiful stories of pain, heartache and rock ... Maggiori informazioni bottoms. Each story lovingly tells a tale of how they overcame their own unique struggles and situations, to transform themselves in powerful ways into the amazingly empowered women they are today. These D.I.V.A.S. stories have remained untold until NOW! Thank you Shavannah for an awesome interview!